MEAD and MACHO have agreed to form a coalition government, holding 40 seats to the opposition's combined 38. The election results started well for the WTA, quickly not only capturing all three seats in Pelargir with an astonishing 90% of the vote, but notching up unexpected wins in Evendim and Erebor, areas where MACHO had been expected to challenge more strongly. Early press releases suggested a majority could be in the offing, and hammering victories in Dol Amroth, where their leader Imrahil was returned with a resounding majority, and Ithilien seemed to bear this out. A trickle of results from further out regions had started to come in telling a different story, however; the Dunlendings, the Cardolanians, and the people of Arthedain found that MEAD's message resonated strongly and rejected the White Tree. MEAD's leader, Alatar, was comfortably elected in Dorwinion, where a small buzz was going around the campaign headquarters at the unexpected wins in Eriador. MACHO had a slow start, and the Greens narrowly avoided an embarrassing scalp as Faramir, just about buoyed up by his personal popularity, narrowly won the third and final seat in Ithilien. A strong result for deputy leader Angbor of Lamedon in the Vales kept the WTA's hopes up, but as things dragged on it became increasingly clear that a majority was unlikely - and the lack of suitable coalition partners for them was a worry. They still, however, retained the hope of forcing an unstable opposition coalition of all three or even four parties. The failure of Rohan, a divided battleground region, to vote strongly for the WTA largely sealed their fate (and was another narrowly dodged embarrassment for the Greens, Eowyn recieving the bare minimum of support needed to win the third seat). Fornost and Erebor appeared increasingly isolated bastions outside their monolithic dominance of Gondor. Midway through the results, the SSS made their only breakthroughs, winning Nurnen, drawing with the Greens in the Upper Anduin and returning Shagrat to parliament. 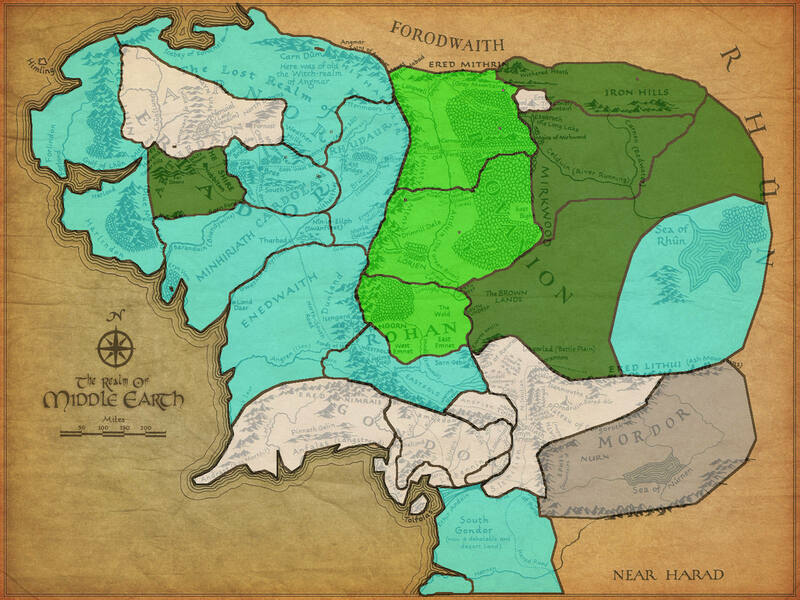 Pallando was returned comfortably in Umbar; the peripheries of Middle-Earth were largely breaking for MEAD, though the WTA was still the largest party and won West Gondor comfortably. The Greens finally got results to cheer about, too, with Mirkwood and Emnet providing their two clear first-place wins of the night and providing them with two seats apiece. It was at this stage, with parliament hanging in the balance, that a long hiatus ended up happening in wrangles over results and ballots. When the disputes were eventually resolved after several months of sending messengers across the continent, the WTA stood with a narrow lead. Their results flatlined as the final, mostly Rhovanian, constituencies finally counted their ballots, however. MEAD remained competitive in Eriador, gaining a huge and unexpected victory in Luin & Lindon which put them ahead of WTA as the largest party. Their strength in the southern peripheries continued, too, with a solid win in Harad, and they beat MACHO's leader, Elladan, into second place in his home constituency of Rhudaur & Eregion. MACHO finally made its breakthroughs in Rhovanion, however, and outright wins in Central Rhovanion, The Riverlands and The Iron Hills (where Elrohir, their deputy leader, received an unexpectedly positive response from the Dwarf populace) rapidly doubled their seat total. The WTA won Minas Tirith, finally cementing their hold on Gondor as a region, but without largest party status their hopes of pushing their way into a government finally faded. - Sentient Beings Rights' Bill to give full legal protections to all citizens in the areas of gender identity, species, sexuality, race, and disability. The right-hand box is raw votes. The ten votes have at times had "boosts" for campaigning added to them. Red is a 3 vote boost indicating a party leader, Orange a two vote boost for a deputy leader, and Blue a targeted seat. The votes were then converted to percentages and gone through using the D'Hondt formula. In the event of ties for a particular seat, the seat went to whichever party was most disadvantaged between their vote and seat share (hence the presence of the "disad" row at the bottom of the seat count). MACHO are proud to be part of Middle-earth's first democratically-elected coalition government and look forward to working with our coalition partner to bring a progressive social agenda to Middle-earth and heal its many divisions. This government will ensure better representation for hitherto-neglected constituencies and has been elected by the people, for the people and will serve the people to the best of its considerable abilities, given its leadership of two Maiar and two Elven princes. 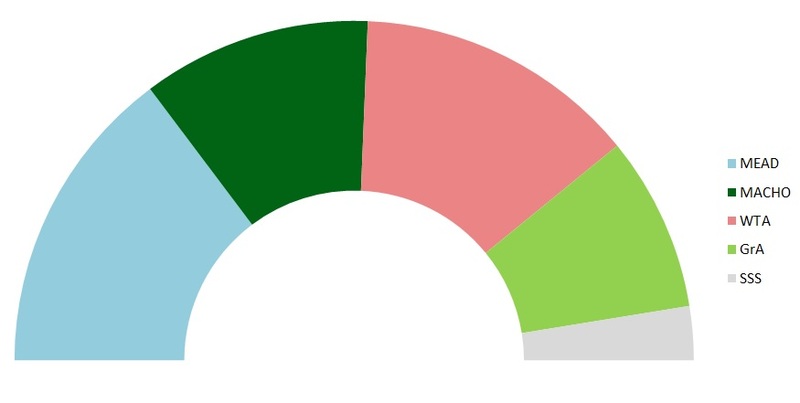 The future's bright, the future's bluey-green (according to the Parliament graphic). I, and the rest of the Middle-earth Alliance for Democracy, are humbled and honoured by the trust so many citizens across Rhovanion, Eriador, Rohan, Gondor, and other lands have given to MEAD and its representatives. Today, we renew our pledge never to waver from the reasons we entered this political race: to bring liberty, democracy, and a better future to all in Middle-earth. We have already set out a coalition agreement with MACHO, which we believe will allow us to pursue our manifesto to the greatest possible extent. We hope that voters will sense the strong MEAD flavour in this government, and we are excited at the chance of working together to bring well-funded education services to Middle-earth and to give farmers and small businesses the economic freedom they need to prosper in the coming years. Whilst we have agreed to a MACHO proposal for a small and flexible federal force to help protect our economic routes and border regions, we stand as firm as ever against state over-reach and can reassure voters that appropriate safeguards will prevent the federal government deploying such a force except where invited by the appropriate local authorities. In the same vein we are pleased to confirm that state surveillance, so terrifying a prospect in the past, ends here, ends now, and ends forever; after the dominion of Numenorean overlords or the might of Sauron, the people of Middle-earth are now free - free to do what they do best and live the best lives they can, with the support they need to prosper and thrive. We wish to thank our opponents for a well-fought race; we call upon them to accept the result of this election, and to work with us and support us to improve the quality of our policies, especially to help keep this government connected to areas of Middle-earth that are less heavily represented among the government ranks. As the leader of this government I will always be happy to hear from the opposition benches; we are nothing if we are not pluralists, and we should celebrate and not denigrate the wide diversity of views that will be heard on the floor of the new House. Middle-earth has found itself, I have no doubt, at a crossroads; and now we walk the long road to a freer, kinder world. It will not be without its rugged patches, and its winding paths, for no road is; but I promise you today that as your leader I will never cease to walk it with you, never falter and turn aside, never put anything ahead of your communities and your concerns. Whoever you voted for, I want my government to govern for you, and hear your voice. It is this - to give power to the free peoples of Middle-Earth - that is the goal of MEAD as a party, and my goal as your new leader. Today is the day that Middle-earth has spoken; and it says that your birth alone shall not determine your path in life. Middle-earth has spoken, and it says that no matter who you love and no matter who and what you are, this is your land and your home and you are welcome here. Middle-earth has spoken, and it says that the days of fear have ended, that the clouds of the past have lifted, and a new verse of the songs that formed our world begins today! Thankyou all for your support and your kindness; I am deeply, deeply humbled and honoured to accept the role of first minister of Middle-earth. I still don't understand any of this. Shagrat of the Shiny Shirt Society would like to graciously thank all of his voters. While the mighty Shagrat does not have enough power to fulfill the designs of the Shiny Shirt Society at this time, he will not be a powerless pawn in this government. As the only Orc representative this government is only improved by his great presence. He will wear his own Shiny Shirt with pride and smite any who scorn him! In future though, VOTE MORE FOR SSS, VOTE MORE FOR SHAGRAT!!! A short post-election study has been done dividing voters into a set of ethnic groups (Arnorian/Gondorian, Western (aka Bree-men, Dale-men, Rohirrim), Other Human (Umbarian, Haradrim, Khandish, Lossoth, Dunlending, etc), Elf, Dwarf, Hobbit, Orc/Goblin, Other). The correlations between these groups and vote percentages were then calculated. Some expected correlations; the strongest one being that SSS voting is very closely defined by the numbers of Orcs (0.85 correlation), and WTA voting was almost as correlated with the Arnorian/Gondorian population (0.76). MEAD's only notable positive correlation was with the "Human (Other)" category; appealing to these often marginal groups seems to have been the main key to their victory. Green Arda did well in seats that were more Elven and with more in the Other category (aka Ents and Eagles). Their strongest correlation, however, was with humans in the "Western" category. MACHO's only correlation above 0.3 was with dwarves. They also had the strongest negative correlation in the table, at -0.49 with Arnorians and Gondorians, whose presence seems to have been a major dampener on the party's support.